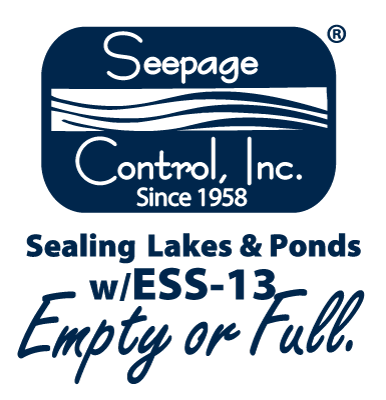 Welcome to Seepage Control, Inc.
Seepage Control, Inc. is a woman-owned small business established in 1958. 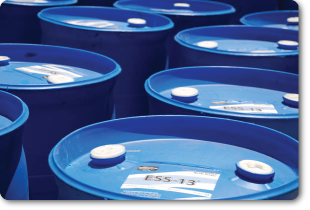 We manufacture and sell ESS-13, a liquid polymer emulsion that reduces the hydraulic conductivity of soils beyond their natural capability by filling voids as well as chemically and electrically modifying the alignment of the clay platelets in the soil. ESS-13 is cost-effective and compliant with EPA regulations. Surfactants – specially designed to reduce the electrical charges on clay platelets. This reduction of electrical charge minimizes the natural electrical repulsion of the clay particles at the molecular level. Emulsified vegetable oil – micron sized droplets fill voids and “lubricate” the clay platelets allowing for more efficient realignment. Both of these components work together to improve the mechanical compaction of soils. Laboratory and field tests repeatedly show that introducing ESS-13 into the soil matrix decreases the hydraulic conductivity of the soil significantly; many times by a magnitude to a magnitude and a half. ESS-13 has three basic formulations, depending on the application method, and each formulation is slightly different. 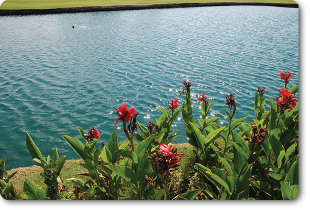 Whether you have a pond, lake, lagoon, storm water holding pond, golf course pond, fish hatchery, water-ski lake, or wetland, we encourage you to call us for a free consultation. For decades our lake sealing products have been applied throughout the United States and the World. We pride ourselves on getting jobs done quickly and efficiently, and stand behind our work. You can't afford not to call us. No pond lining or lake lining project is too large or too small. Thank you for your interest. We look forward to hearing from you at 1-800-214-9640, or locally in Phoenix, Arizona, USA at 480-763-1180. Visit our Contact Us page here.